After fracturing my ankle in Arequipa, I’ve been crutching around Peru for almost two weeks now. Many of the friends and family I’ve spoken with sound surprised at my choice to continue traveling, but after all I only have 13 more days until I return to San Francisco. After a week of doing little more than lay around in Arequipa, my boyfriend met me in Cusco last Saturday. Since it’s been five weeks since we’ve seen each other it was great to spend time together, although the circumstances weren’t ideal. I’ll admit when thinking about Machu Picchu, the picture I painted in my head didn’t exactly include crutches, but we made the best of it. You wouldn’t believe the array of comments I received from locals and tourists alike while visiting Cusco and Machu Picchu. How could I come all the way to Peru and not see Machu Picchu? Impossible no, difficult yes. Then again nothing good in life every comes easily, or at least that’s what I’m told. I’m not saying that crutching around cobblestones streets of Peru at a snail’s pace is always enjoyable, of course there are moments everyday when my frustration level peaks and I just wish I was home. But cutting my trip short, paying $1k extra, and somehow getting around hilly San Francisco on crutches doesn’t sound like a great option either. I’m confident my upper body strength will at least double by the end of the four weeks on crutches! Instead of spending time in the balmy Amazon or trekking in the Cordillera Blanca as planned, I left the crowded “gringo trail” in favor of beaches and various archaological sites of Northern Peru today. Gringa con muletas, coming soon to a archaeological site near you! I’ll be working on my tan and upper body strength for the next two weeks in Northern Peru! Your optimistic attitude is really inspirational! 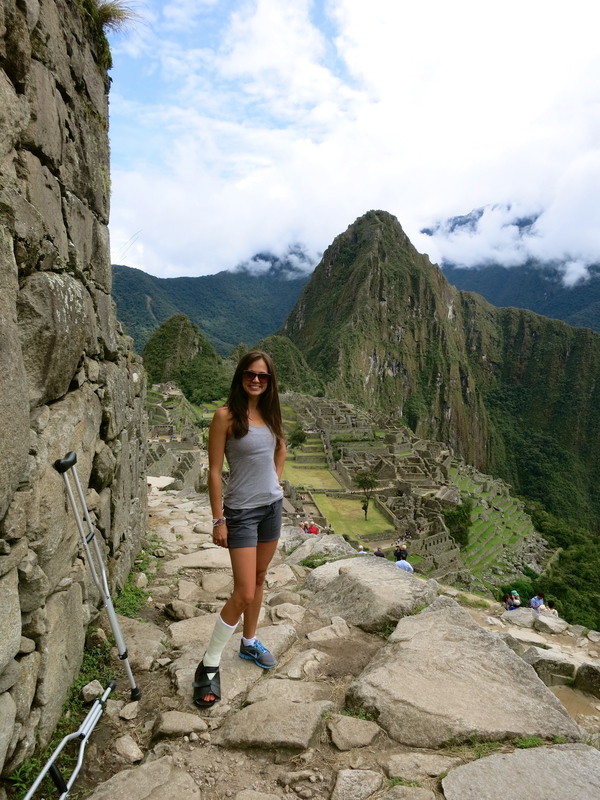 I’m hoping you can offer some advise from your experience of getting around peru with crutches. I just fractured my foot and have crutches and am scheduled to leave for peru this Wednesday! I have tickets to both huaynu picchu and Machu Picchu, I’m planning on going to lake titicaca along with seeing all the ruins in the sacred valley. Some of my friends and family are encouraging me to postpone the trip, but I want to go! Is it worth it? Can I still see everything with crutches or possible a walking boot cast?